The following are the articles the Limburgs Dagblad wrote about my search for information about my father's part in WWII and Indonesia and the hope that I could find out who the people are in the photograph. They did make one error in the articles though...they put my mom's name as Mario and it is Marion but typos do happen especially with unfamiliar names. Many thanks to Mr. Cor Korremans for contacting them about me and asking them to help, and to Hans Toonen and Ray Simoen for the time and effort they put into the articles. Special thanks to the people who responded to the newspaper. This was the very first article written. Daughter in Canada seeks for traces of - resident of Hoensbroek - Josef van Duinhoven. 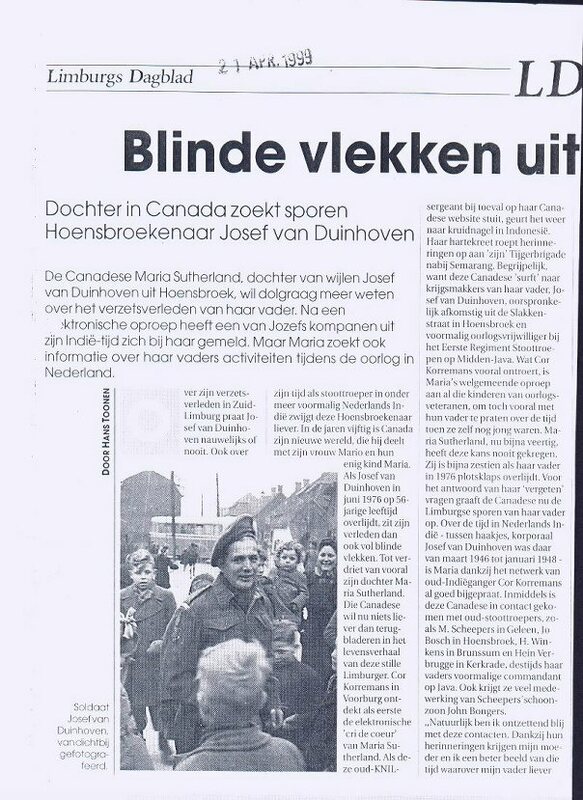 Canadian, Maria Sutherland, daughter of the late Josef van Duinhoven of Hoensbroek, would love to know more about her fathers' past life in the resistance. After an 'electronic' call, one of Josef's peers from his time in Indonesia called her. But Maria is also seeking information about her fathers' activities during the war in the Netherlands. Josef van Duinhoven rarely or never talks about his resistance past in the South of Limburg. About his time as a Storm-Trooper in the former Dutch Indonesia, the former resident of Hoensbroek would rather be silent. In the 50's, Canada is now his new world which he shares with is wife Marion and their only child, Maria. When Josef van Duinhoven passed away in 1976 at the age of 56, his past is filled with blind spots. To the sorrow of, especially, his daughter Maria Sutherland. This Canadian wants nothing more than to turn back the pages of the life of this quiet Limburger. When this old KNIL sergeant by chance sees her Website, it smells again like cloves of Indonesia. Her cry from the heart calls back memories of 'his' Tiger Brigade near Semarang. Understandably, because this Canadian 'surfs' to find comrades of her father Josef van Duinhoven, originally a native of the 'Slakkenstraat' in Hoensbroek and a former war volunteer at the 1st Regiment Storm-Troopers in Middle Java. What really moves Mr. Korremans, is Maria's well-intended call to all the children of war veterans, to talk with their father especially about the times when they themselves were still young. Maria Sutherland, now almost 40, never go this chance. She is just sixteen when her father in 1976, suddenly passes away. For the answers to her 'forgotten' questions, the Canadian now digs away for the Limburgse traces of her father. About the time the Dutch Indonesia - (Corporal Josef van Duinhoven was there from March 1946 till January 1948) - thanks to the network of old Indonesia goer Cor Korremans, Maria has already received a lot of information. Meanwhile this Canadian has come in contact with old Storm-Troopers such as M. Scheepers in Geleen, Jo den Bosch in Hoensbroek, H. Winkens in Brunssum and Hein Verbrugge in Kerkrade, her father's Commander in Java during that time. She also gets a lot of help from Mr. Scheepers son-in-law, John Bongers. "Of course I am very happy with these contacts. Thanks to their memories my mother and I get a better view of a time over which my father would rather be silent. Good, after a few pilseners (beers) he sometimes wanted to unload some of it. I was still young then, and for a girl in Canada the military operations in Indonesia were indeed a far-off war. To be silent then about my interest in my fathers' past in the Limburgse resistance during the German occupation. Even about the time as a miner, he hardly spoke. I did know the his lungs were damaged as a result," says Maria Sutherland of Cottam, her residence in the Canadian province of Ontario. Luckily is the Eastern mining area, her fathers' birthplace, no blind spot. In June 1975, she was with her father on holiday. "My grandparents weren't alive then. For the first time in my life I saw a real Castle in Hoensbroek. And my uncle Emiel who has since passed away took me along to a circus. A holiday to never forget, because a year later my father died." Maria Sutherland would like to have more information about the two blind spots in her father's life: His role with the resistance in south-Limburg, and especially about the woman on the post war photograph. "I mean the woman who put her arm across his shoulder. I know from my Dad that he gave her bread when she was imprisoned. Who knows or recognizes this woman? That fascinates me. Of course I would also like to know who the other people in the group photograph are." Where and by whom the photograph was taken is easy to guess for the editorial staff of "Spoorloos". In Nijmegen, by photographer A.M. Verway, it says on the back of the snapshot. The place is even recognizable: the St. Stevens church, downtown Nijmegen. 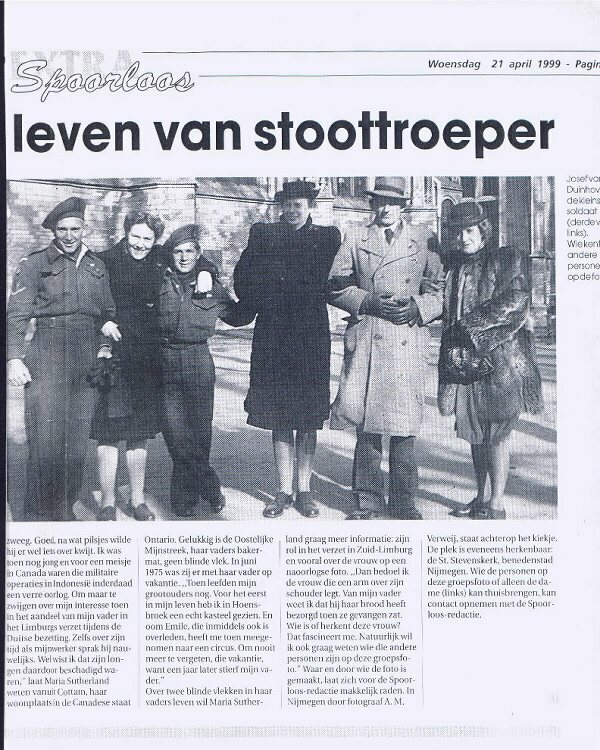 Whoever recognizes the people in the group photograph or only the lady (left), can contact the Spoorloos Editor.